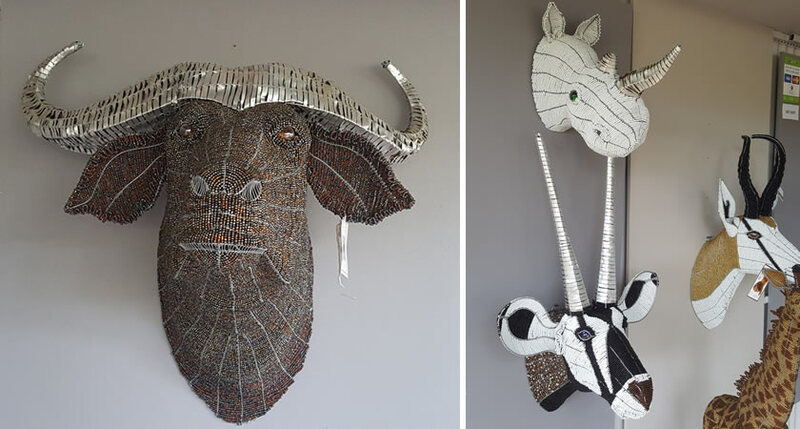 George Dokora makes bead and wire animals and trophy heads, some of which feature horns decorated with recycled aluminium strips. "Initially I was helping my brother making leather. I met a friend doing wire and started helping him too. Everything I tried came right and I realised that this was my field. So I left the leather. That was in 2000 in Johannesburg, we were selling at the traffic lights. Fortunately we met a few clients and started supplying them. 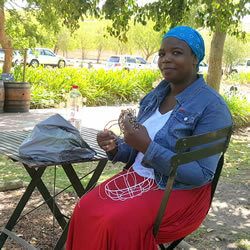 By 2003 it went cold, there were a lot of people doing beadwork, and we moved to Cape Town. We started again at Rondebosch traffic lights, got some clients and then I applied here at Spier. My head is crowded with a lot of ideas, I always know I can do better. I love watching Nat Geo, the animal programmes, so that’s where my inspiration comes from. Also from fellow artists. If I see someone making a nice piece it always encourages me to do better. If he can make something that nice, I’m also capable of doing it. I’m always looking for new ways of doing things and I’m working on a few new ideas for next season. Coming here to Spier I saw myself making progress. Sue pushes you to do your best. 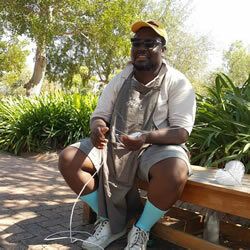 I’ve learned a lot here, from Sue and from working with other artists like Bongani. Sometimes as artists we need to work together, sharing ideas and seeing things from another angle." 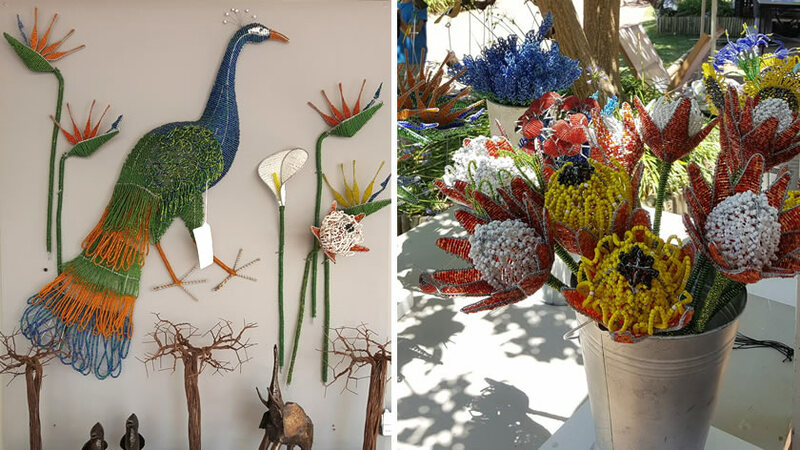 Morris has developed a line of bead flowers, from proteas and arum lilies to strelitzia and agapanthus. He’s also experimenting with 2D wall hanging pieces of peacocks and dolphins. 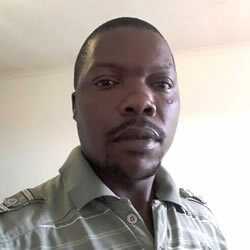 “I did wood turning at home and was trying to earn enough money from it in Joburg to go back home again, but wasn’t doing so well. Some guys doing beading started giving me work, first for food and then I was earning a little money. I started to make small geckos, frogs and ladybirds. Then the ladies came and wanted some stuff made and my pieces sold well. I made enough money to go home. The next trip I didn’t bring wood turning materials, I brought my father’s pliers! That was the start of my wire business. The flowers were a Cape Town thing. Back in 2003 there weren’t many big pieces being made, just keyrings and small trinkets. A lady asked me to make her a strelitzia and I didn’t know what a strelitzia was! I looked them up on the internet and started to make flowers. I was working with Jimmy, Francis and my brother, each making different flowers until between us we had a mixed bunch of flowers. We’ve made daffodils to order for a lady from England. The peacocks developed over time, and the new 2 D wall-hanging pieces of dolphins and peacocks. I play around with a lot of designs for fun. “Bishop and I work together. He’s the one who first started doing the bead and wire work. Then I joined him in the business. It’s a skill that he acquired from his grandfather when he was growing up. He used to make wire cars. The beading is a self-taught skill. He started adding beads to wire cars when he came here, then started making animals, lions and lizards. Next he got into the bowls, first he would just buy a frame and bead it. But as time went on he started making his own frames and designing his own shapes. The colour combinations are all his designs, that‘s where the art is. We put the beads on in a pattern, not random, starting with a darker shade and it gets lighter. We call this one ‘the 50 shades of blue’. We’ll decide the pattern and put all the beads on first. We’ve been at Spier more than 8 years and we have a shop at the Watershed at the Waterfront. Bishop also makes animal heads, but I’m still learning to do a proper job on them. I’ve already made a zebra (my totem animal) but I’m not quite happy with it yet. Hopefully by next season I’ll be challenging the boys! 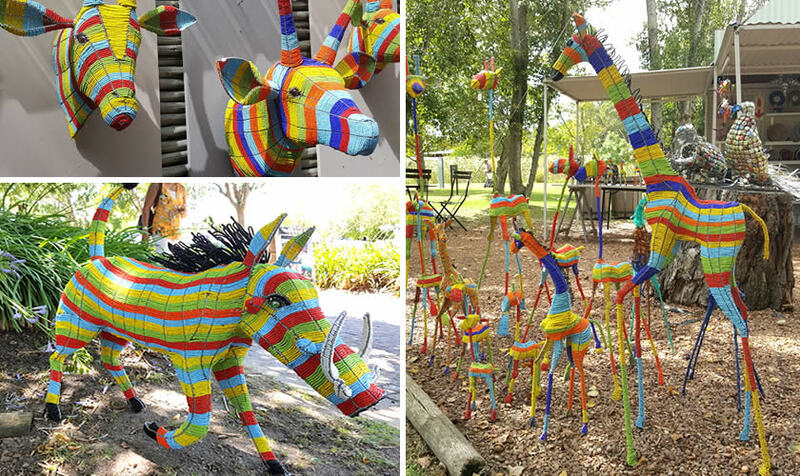 Prosper Mabhiza makes a funky, eye-catching range of African animals and heads beaded with a distinctive colourful rainbow pattern. 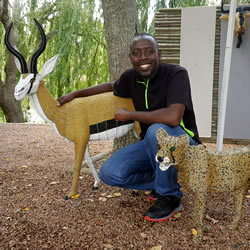 “I started at a tender age making toys from wire because my parents could not afford to buy toys for me. It was like a hobby also, for I was so young, so that's where I learned to work with wire. As I was growing up I started to see some more designs. Because of how much competition there is in beads, I decided on the rainbow and its colourful stripes. This design really catches the eye of everyone and is something unique. What inspires me a lot is the compliments I get and the sales I make. 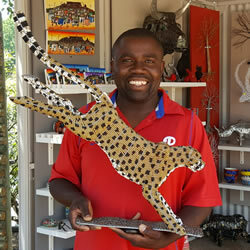 Bongani Khumalo is one of our top selling bead and wire artists making beautiful full size animals and trophy heads. 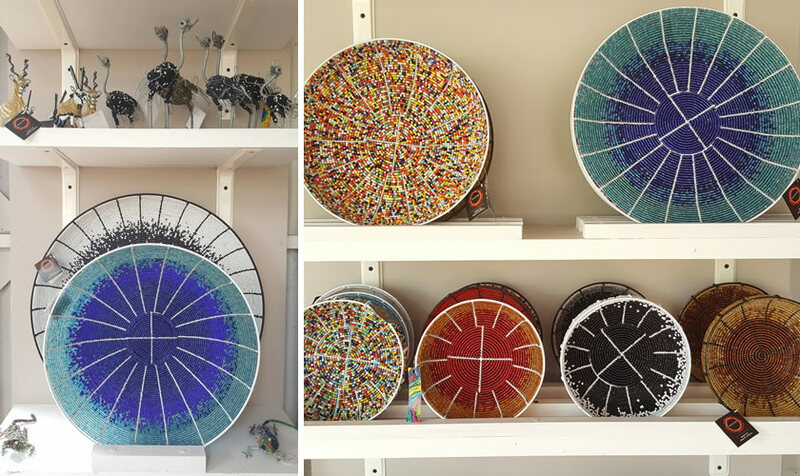 See their beautiful bead and wire work for yourself at Spier Craft Market. We’re open daily until the end of April from 10am till 5.30 pm.